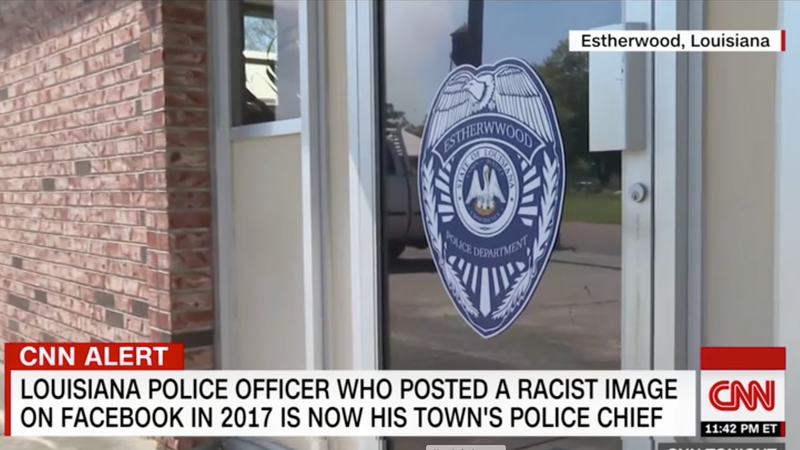 Therefore, even though Wayne Welsh, the new police chief in Estherwood, La., shared Islamophobic and anti-black social media memes, he’s not necessarily racist. He’s a racism enthusiast, a white supremacy aficionado, a connoisseur of blatant bigotry. Chief Ernest Villejoin Sr. told KATC that he spoke with Welsh by phone Tuesday morning. Villejoin said that although Welsh had apologized, he would not tolerate this kind of behavior, and he personally apologized for Welsh’s actions. Welsh is expected to turn in his resignation Tuesday evening. Except, none of that happened because Wayne Welsh is a racist liar not very experienced in truth-telling. Welsh never lost his job because Chief Villejoin untethered his remark about not tolerating Welsh’s behavior from the truth. Some people call that a “lie,” but you know the rules. According to CNN, Welsh was briefly named interim police chief last year until he ran unopposed for the seat in November. Donald Popp, the new mayor of Estherwood, said Welsh’s racist meme was a “big misunderstanding,” seeming to indicate that either Welsh is illiterate and didn’t understand the words on the post or that Popp is also a big racism advocate. “As the new mayor, I don’t see any problems or foresee any future problems with him. I was hoping this would have been taken care of,” said Popp, who was not mayor when Welsh thought it would be hilarious to share a little bit of ethnic cleansing bathroom humor. The town of about 960 is 2.9 percent black and 91.1 percent white. Six black residents in Estherwood declined to talk to CNN on the record because they feared retaliation. I wonder what they were so afraid of? I mean, I know that the person who is literally in charge of the law in a tiny, white Southern town was bold enough to share his racism with the world and paid absolutely no penalty for doing so. Sure, the mayor, the former police chief and the citizens who put Welsh in power don’t seem to care; but that doesn’t necessarily mean that the black people have anything to fear. If we are adhering to the rules, the town isn’t racist, remember? They just promote people who do racist things. Some might argue that we refer to people who farm as “farmers” and people who dance as “dancers,” but those people are using logic and common sense, something that people who buy lotion based on SPF need not worry about. Just because one does a thing, it doesn’t mean they are that thing. And Wayne Welsh isn’t a racist. He’s a “former participant in racist activities.” He’s a discrimination devotee. A prejudice proponent. A defender of daughter-drowning. Why They Kneel: Are White Cops Worse?